"Sun-Kissed" Life Planner Stickers will warm your thoughts and creations with memories of the lake, ocean, cottage or pool! Summer is lived outdoors and what a better place to be in the heat of the days than at the water's edge. 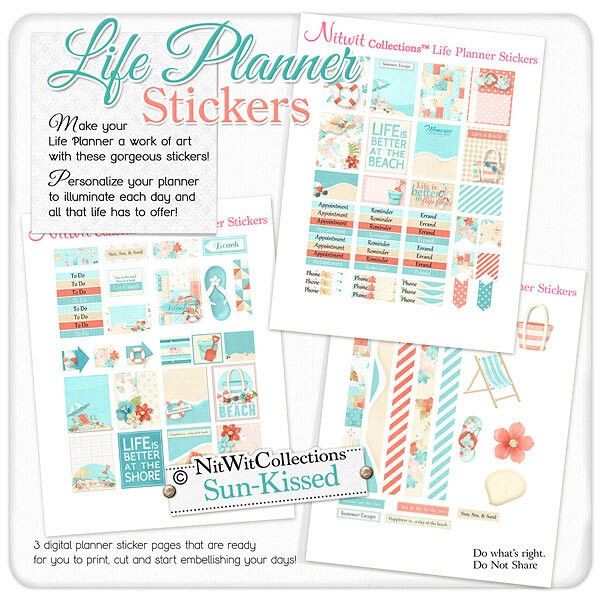 Bring that summer beach life to your life planner with this wonderful life planners sticker kit. 17 - 1.5" x 1.9" full boxes with the water and beach scenes to give your life planner that Summer feel! 6 - 1.5" x 0.95" half boxes to personalize the tops of several days....does it make you want to play hooky from work or school?? 3 - Arrow elements letting you know which way to the water...or the bathroom?! 3 - Square embellished tags to use as the perfect adornment for those blank areas....ahhh the beachy feel! 5 - Word strips to give you a few phrases and sayings that are quintessential beach!